My son and daughter-in-law went away for the weekend, so I got to babysit my grand-dog, Luke. Luke is a beautiful and lovable German Short-Haired Pointer with piercing light brown eyes and a wonderful soft coat. But of course, he’s nuts. To babysit this dog, all you have to do is turn on a light that throws some sort of shadow on the wall. Luke will then sit there and stare intently at the shadow as if he’s certain it will jump off the wall at any moment and he must be ready to pounce on it. His focus and patience are amazing. Bumping the light so the shadow moves causes Luke’s muscles to quiver and his ears to peal back with excitement. This routine can keep me—I mean him—entertained for hours. But my grand-dog is a great listener. There’s been much on my mind lately and over the weekend, Luke and I had some long talks. There were no judgements or wary glances or hints of ridicule or condemnation as I rambled on. In fact, he didn’t say anything. He just looked up at me with his kind eyes and listened. I’m not a very good listener and need to learn from my grand-dog. I usually begin offering my “wise” counsel and advice before others have even finished their sentences. The classic Bible story in the book of Job tells of three well-meaning friends who offered advice without really knowing or in any way truly comprehending what Job was feeling or what was taking place. Most think the best advice they gave was when they just sat next to Job in silence. No doubt, that’s part of my problem. If there is a gap in the conversation, I feel it’s my job to fill it — even if I have nothing to say. I remember a friend’s anguish as he quietly told me of his son’s drug addiction. His heart was breaking and he didn’t know what to do. He just needed to talk it out a bit and have a friend listen. He took a breath and left a vocal pause and I jumped in and began spewing meaningless advice without knowing anything of what he was experiencing or how to help. I was just like Job’s friends. Thankfully, the One with all knowledge is the best listener of all. He knows how to listen. And thankfully, He loves to hear everything that’s on our heart and mind. He doesn’t even mind if you ramble on and on. And unlike my grand-dog, Job’s well-meaning friends, or me, He has the power to answer our prayers according to His perfect will (1 John 5:13-15). I suspect that’s why the Psalmist said, “I love the Lord because he hears my voice and my prayer for mercy. Because he bends down to listen…” (Psalm 116:1&2). Our dog, Bentley, has fallen deeply in love with my wife, Jenn. He has also become rather protective of her. I found this out the hard way when I leaned over to give Jenn a kiss while Bentley was lying beside her. Instead of the nice soft embrace of my wife’s lips, I got a face full of Bentley, who with amazing quickness and agility, sprang between my face and hers and pushed me away with his long, wet nose. I jumped back with a start and stared at this crazy dog who was now suffocating my laughing wife under his protective paws. Not one to easily give up when it comes to getting a kiss from my wife, I leaned over once again searching for her lips. 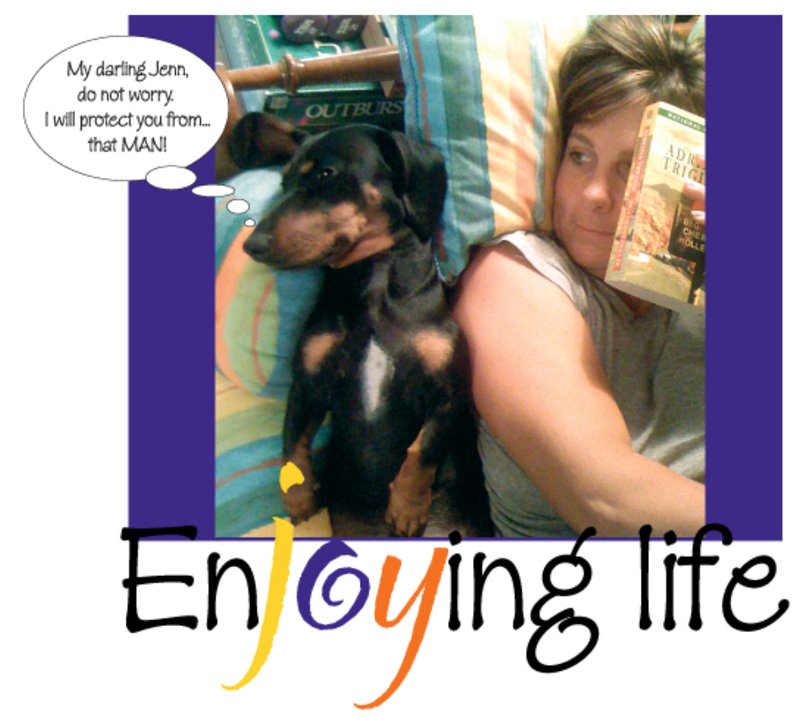 This time, Bentley started barking and positioned his long body completely over Jenn’s head. By this time, Jenn was laughing hysterically and Bentley-the-Protector was barking madly to keep me away. The battle was on. Man versus beast. Passion versus protection. Crazy dog versus desperate husband wanting a kiss. I cautiously circled the sofa. Bentley stared at me with his big, black eyes with Jenn safely secured under his paws. Tail wagging, he watched my every move. When the moment was just right, I jumped in, scooped Bentley up in my arms, ran the yapping dog into the other room with the tile floor. I put the frantic dog on the tile floor, held him back from running, and took off for the sofa to retrieve my kiss. As I ran toward Jenn, I could here the clatter of Bentley’s toenails flailing wildly on the tile floor desperately trying to get traction so he could beat me to the couch. His spinning legs gave me just enough time to race back to Jenn and win my kiss. Man had won over beast once again. Oh, the simple pleasures of life. Playing with a dog. Working hard for a kiss. Laughter. The list of ways to enjoy life is truly endless. I recently heard a wonderful message on creation. I was enthralled when the pastor suggested that God may have “sung” the world into existence. Of course, we have no idea if this is the case, but I love that imagery. Just imagine the beauty and joy of God’s voice singing as he creates stars, galaxies, and you and me…into existence.